This has been one of the weeks when we’ve only left the campground a handful of times for the absolute necessities (like the laundromat & liquor store). Good for us, but not so good for an interesting blog post. I almost skipped it altogether, but since we’re heading into Vermont this weekend for an extended amount of time, I wanted to at least make a mention of our last week in New Hampshire. Also, I wanted to show off the new pillows I made for our couch. This is the third set of pillows I’ve made for the Airstream couch. Three years, three sets of pillows — not bad. While my main reason for making new pillows so often stems more from the fact that I like redecorating than them wearing out, I have to admit that the old ones looked pretty flat and sad next to the fresh new set. 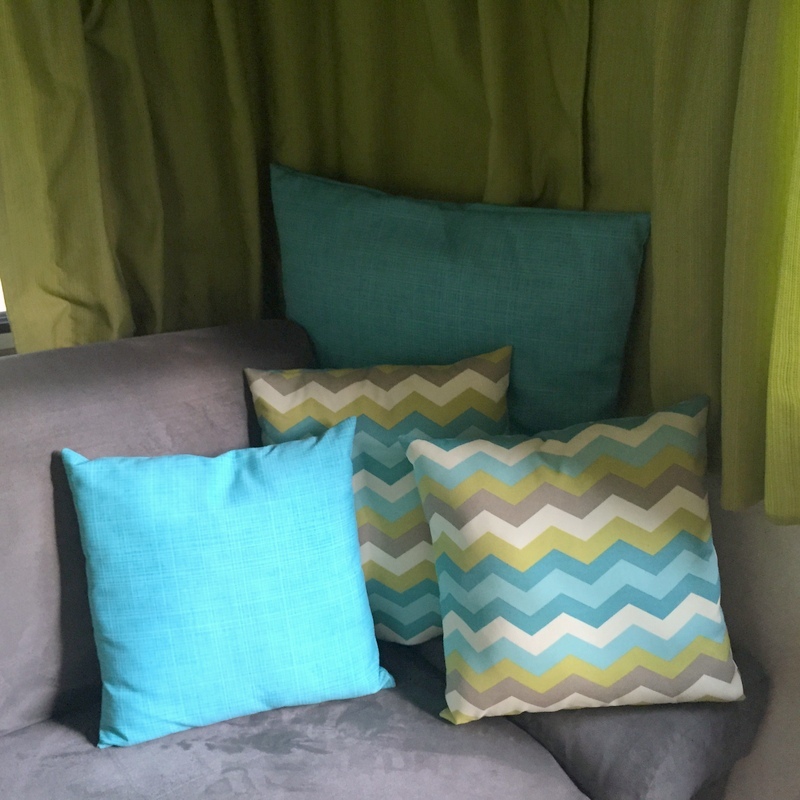 The pillows are the just the beginning of a long list of projects we’re planning to tackle around the Airstream. After much discussion we’ve decided to stick with this Airstream for the time being instead of looking for something larger. The reasons are numerous, but what it boils down to is that we like our tiny home. 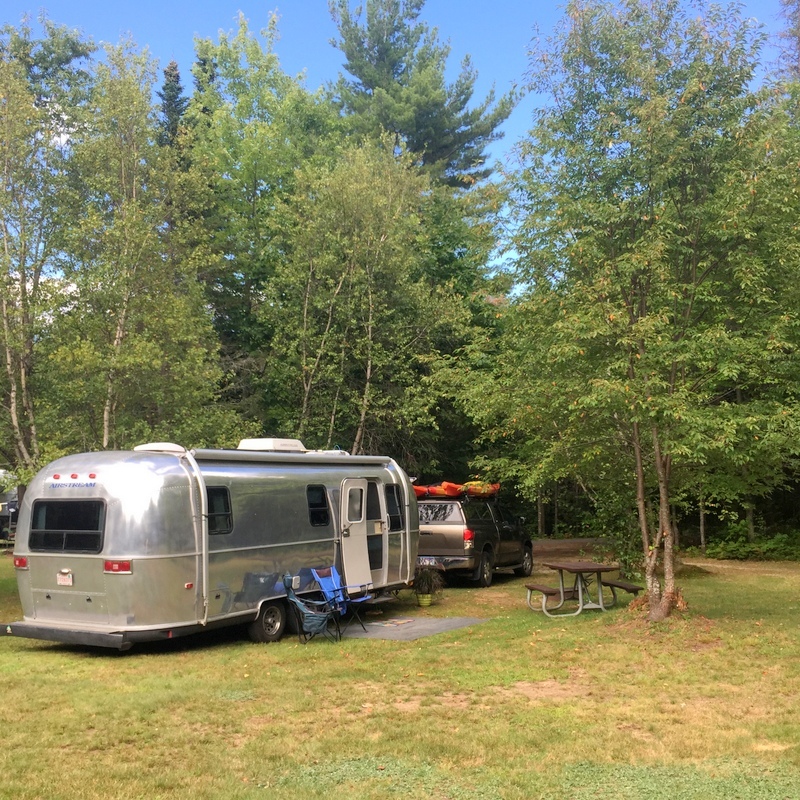 The thought of starting over and renovating another used Airstream (new is not for us – we enjoy the freedom of not having a monthly payment) is simply not appealing at the moment. So we’re going to stick with our beloved 25′ Safari and simply make it the best it can be. The plan is to get as many projects as we can crossed off the list over the next month while parked in the driveways’ of friends and family. I hope to document the projects and share them as we go. So get ready for a blast of posts about a bunch of fun, and not so fun, renovations. In the mean time, I leave you with this photo of our current location. Looks pretty peaceful doesn’t it? 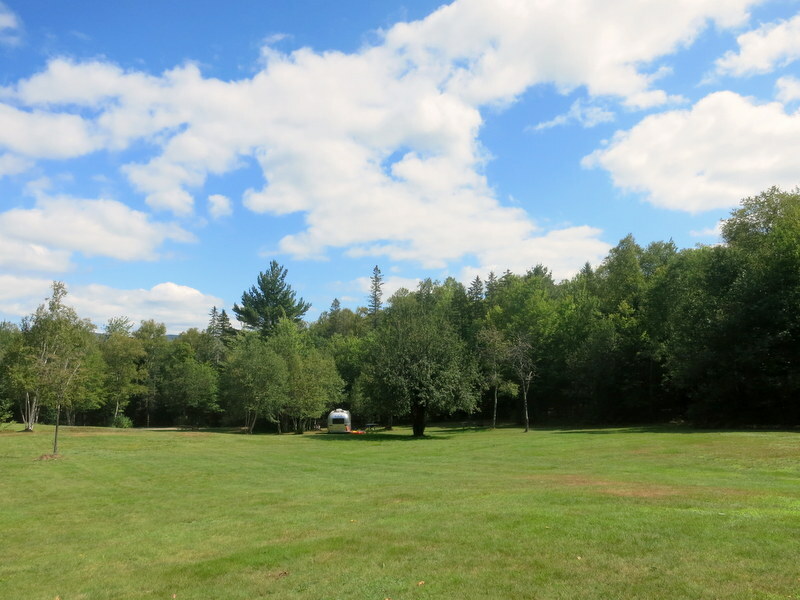 Oh, I almost forgot…the campground we’re staying at this week is called Moose Brook State Park. It’s in the White Mountains not far from Mt. Washington where you can hike, drive, or take the cog train to the top of the highest mountain in the east. Or, you can be like us and hang out at the campground all week. Either way, it’s a great spot with huge sites, trees, grass, bike trails, and even a swimming pond. Love the new pillows, we just bought a RV to travel. First time ever, looks fun. Do you have any issues sewing in yours? I also wanted to bring my sewing machine with us to do things. Also I was thinking, do other campers ever ask you to do repairs while you are on the road. Like a side alteration business, gas money? Great job and thanks for sharing. The only potential issue with the sewing machine is that I can only use it when we have electric hook-ups, so I try time my projects accordingly. 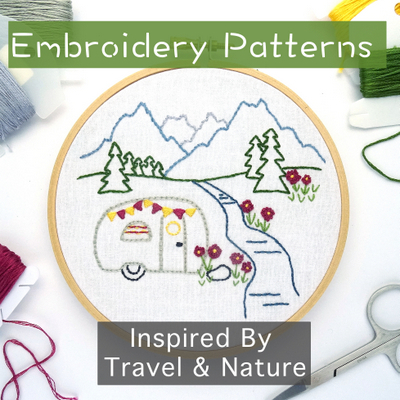 I’ve never had other campers ask me to do sewing projects, but I bet there are people out there who would be interested in the this type of thing. Congrats on your new RV! Seriously? That’s a campground? It looks like you have an estate all to yourselves! Love your new pillows. Well to be fair, all that grass is the common area between sites, but with no other campers around we had it all to ourselves! That is a gorgeous camp site! I envy you your talent with the sewing machine. 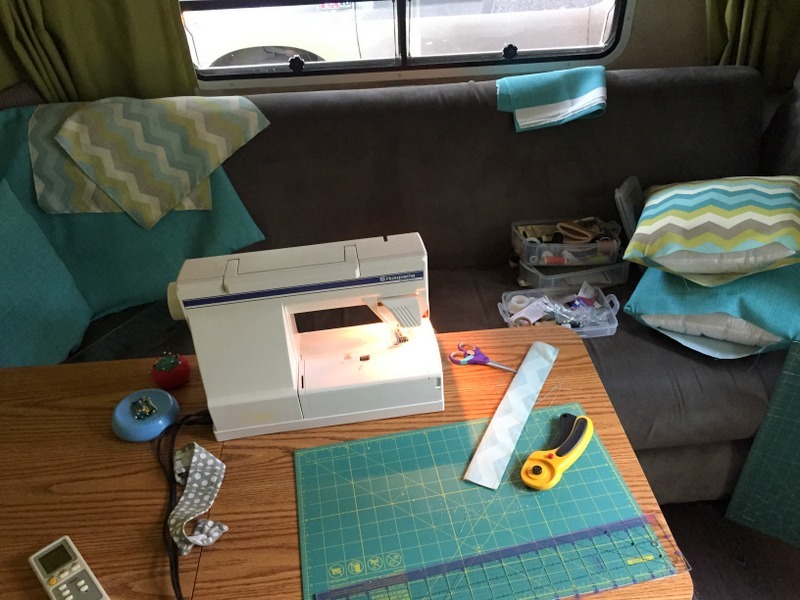 My mom and my daughter are sewing fiends as well as other family members…but I am all thumbs when I try to sew with a sewing machine! Very, very nice job on your pillows. Did you have the campground all to yourselves? Looks like a great place for some peace and quiet. Love those new pillows Amanda. I would stay at the campground too :-) Your pillows match my ottoman perfectly! So of course I think they’re wonderful. Looking forward to seeing all your projects.